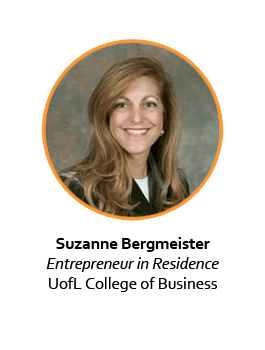 Suzanne Bergmeister has fifteen years of experience working with entrepreneurs and start-up companies. She is currently the Entrepreneur-in-Residence at the University of Louisville. In this capacity, she teaches in the Entrepreneurial MBA program, the Professional MBA program, the Global MBA program, and the undergraduate Entrepreneurship Minor. She also mentors all of the MBA and undergraduate Business Plan Competition teams. Suzanne formerly worked in the Private Equity Industry for Fort Washington Investment Advisors, Blue Chip Venture Company, and Chrysalis Ventures. In 2004, Suzanne founded Sunflower Business Ventures Inc. Sunflower specializes in business consulting and management, education and training, and angel investing activities. She founded the Sunflower Seed Funds as an investment vehicle for not-yet-accredited investors. Suzanne has a BS in Electrical Engineering from Rutgers University, an MS in Electrical Engineering from California State University and an MBA from Cornell University, concentrating in Finance. Suzanne is the President of Venture Connectors (formerly the Venture Club of Louisville) and is on the Advisory Council for the Purdue Technology Center. She serves on the Board of Directors of the Community Foundation of Louisville, Algood Food Company and several start-ups. She is active with the Leadership Louisville organization and is a graduate of Focus Louisville (‘02), Leadership Louisville (‘05), and Bingham Fellows (‘07). Colonel Bergmeister is an Air Force reservist with 28 years of service. She began her Air Force career at Edwards Air Force Base in California where she was a Flight Test Engineer on the B-1 Bomber and the B-2 Stealth Bomber, and taught Electronic Warfare Testing at the Air Force Test Pilot School. She is currently still an Air Force Reservist, assigned to the US Air Force Academy in Colorado Springs, Colorado. She lives in St. Matthews with her black lab/shepherd mix Zeus and cat Lola. Suzanne’s son, Karl is at the US Naval Academy in Annapolis, Maryland and hopes to become a Marine.